Furnishing a new home can be a pain. It’s a delicate balancing act between buying furniture that is cheap, of a high quality, and looks good in your home. Much along the vein of vintage clothing, vintage furniture can provide a home with sophisticated, well-designed aesthetics without breaking the bank account. And while some vintage pieces might have seen better days or contrast with the beloved minimalism that runs the modern home-decor aesthetic, they are often great chances to add character and uniqueness to a home. We are blessed in Denver with a variety of great and easily accessible vintage and antique used furniture and decor shops. In this regard, there is an assortment of shops of all price ranges and types of collections, allowing even the most broke amongst us to imbibe in the wonderful world of vintage furniture. When: Tuesday – Saturday, 11 a.m. – 5 p.m. The Lowdown: Tresor’s wonderful collection of antique pieces is more for the seasoned homebuyer than the college student. A lovely, bright store that feels like a European grandmother’s house, Tresor holds a grand collection of pieces that could add character to any dwelling. However, the prices are quite steep, a reflection of the store’s wonderful antique selection and the surrounding wealthy neighborhood. The store is still worth a visit no matter the price range, as hidden gems are abundant and the staff are helpful and genuinely interested in one’s decor plans. When: Tuesday – Saturday 11 a.m. – 5 p.m., Sunday, 11 a.m. – 4 p.m. The Lowdown: With a specialization in mid-century modern decor and furniture, Garage Vintage is a crunchier, more relaxed space in comparison to Tresor or other more upscale spots in the city. 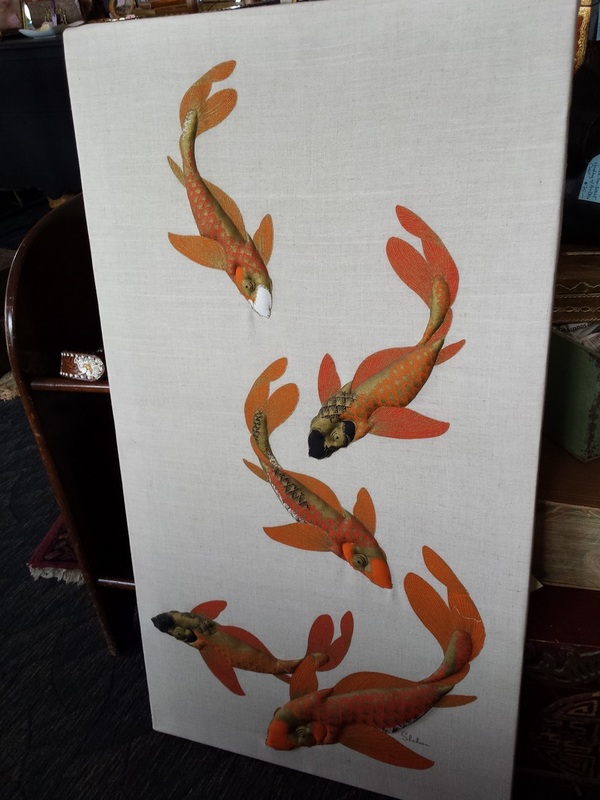 This corner spot in the Sante Fe Art District is a welcoming zone full of stylish furniture and decor, including a wide selection of glassware, tables, chairs and paintings (including a beautiful, $350, 40-inch tall Japanese style koi fish painting). While keeping with the gypsy aesthetic, the colorful boutique space is well organized and most of the collection is priced reasonably for its authentic, vintage qualities. When: Monday – Friday, 11 a.m. – 6 p.m., Saturday and Sunday, 11 a.m – 4 p.m. When: Monday – Friday, 10 a.m. – 6 p.m., Saturday, 11 a.m. – 6 p.m., Sunday 11 a.m. – 5 p.m. The Lowdown: Located at the heart of South Broadway, Decade provides the intrepid furniture and decor shopper with a plethora of interesting vintage pieces. The cute, well–organized shop is a sensory overload of color and material. While the furniture pickings are lower than some other spaces, the furniture that is there is of the highest quality, and almost entirely vintage. Prices are on the higher side, with a vintage teal painted dresser reaching north of $300. When: Monday, Thursday and Friday 11 a.m. – 6 p.m., Saturday, 10 a.m. – 6 p.m., Sunday 1 p.m. – 5 p.m. The Lowdown: Another South Broadway location, this time in the midst of what is known as “Antique Row,” the 1300-1800 blocks of South Broadway, 20th Century Interiors provides such beautiful, high-quality furnishings that one might be intimidated just to step inside, but fear not. Just opened this year, and adhering to its name, 20th Century Interiors is one of the foremost locations in Denver for Mid-Century Modern design. Think the set pieces of “Mad Men” more than your hippy grandma’s house. Pieces here reach very high prices, but the designer names and brands and the quality of the vintage furniture offered here are unmatched. When: Monday – Saturday, 11 a.m. – 5 p.m., Sunday, 12 pm. – 5 p.m. The Lowdown: Sure, all the stores located in this guide can provide a customer with a wide array of furniture pieces and engrossing home decor, but it is only The Antique Broker that offers up a myriad of six-figure fetching vintage mahogany bars. The Antique Broker is a treasure chest of vintage ephemera. While the bars might shock the average shopper, the rest the store is quite reasonable, with prices that reflect the object’s rarity and quality. Inside, objects range from posters, swords, antique dining-ware, typewriters, doors, chests, dressers, tables, bars, cabinets, chairs, rugs and even street signs. Even if you’re not looking for furniture, Antique Broker offers such a wide array of vintage goodness that one can spend a hot afternoon lost amongst the collection. One will leave feeling like they just left a museum because of the wealth of antique furnishings contained inside. When: Tuesday – Saturday, 11 a.m. – 6 p.m., Sunday 12 p.m. – 5 p.m. The Lowdown: Mid-Mod Mall’s large gallery space is one of the most inviting stores in this list. Its Highlands location is a one-stop-shop for beautiful, well designed, mid-century furnishings and decoration. There’s a wide selection of pieces, ranging from large dressers and couches to small drinking sets and lighting fixtures. Besides being wholly mid-century, most of Mid-Mod’s selection is priced extremely well. While not a thrift store of course, Mid-Mod offers shoppers a chance to enter the world of mid-century furniture without going into mass debt, which makes the shop quite a welcome addition to the Denver scene. The Mid-Mod collection is also one of the best curated on this list, with no duds or otherwise lackluster furnishings within sight. When: Monday – Saturday, 10 a.m. – 5 p.m. The Lowdown: The most vintage of the vintage. Scandinavian Antiques is a cacophony of European style, old-timey wood furnishings, brass chandeliers and even large baroque paintings. Located at the end of South Broadway’s Antique Row, the store’s large space — over 30,000 feet to be exact — is a well-organized array of European imports. Pieces here aren’t going to be the cheapest, but being the largest importer of Scandinavian antiques in the country means that the shop has an incredibly wide selection of amazing furnishings and decor. If you’re looking for less “Mad Men” and more 18th-century Swedish palace, Scandinavian Antiques is the place. When: Monday – Saturday, 10 a.m. – 6 p.m., Sunday, 12 p.m. – 5 p.m. The Lowdown: Marked by its large quirky sign (with the backwards “E”) beckoning above the hubbub of Evans Avenue, H&E is a no-frills shop full of a myriad of beautiful, lightly used vintage furniture. The store has a unique piece for everyone, and for rather cheap prices. There’s a great mix of mid-century pieces, antique African wood furnishings, and more-recent used furniture and knick-knacks (as well as two very cute little dogs). There are two whole floors of goodies, and one of the best aspects of the store is its negotiable prices, meaning that one can barter with the friendly staff a price for any piece they fancy. Photo courtesy of Brass Armadillo on Facebook. The Lowdown: The Brass Armadillo Antique Mall is one of the most regularly recommended and highly acclaimed vintage home-furnishing outlets in the state, take a look at any review site and you’ll see that people really enjoy this spot and its selections — especially for a store located a little out of the city. Based in Wheat Ridge, Brass Armadillo’s massive space is filled with over 600 different antique and vintage dealers. This means there really is something for everyone. The prices are up to the dealers, so they can vary widely between different consignment merchants. However, with so many objects for the picking, Brass Armadillo offers a wider selection of goods than any other vintage store in the state. Being such a large space, it is best to spend an entire afternoon picking through the merchandise, and with an on-site cafe, one can caffeinate themselves and go to town on finding the right vintage piece for themselves. My wife and I own Bonnie Brae Lighting & Repair, which fits right in with your article. We have a very large inventory of vintage and antique lighting, all of which is completely rewired before being sold. We also repair all types of lighting in house. We are located next to Bonnie Brae Ice Cream on Ohio. Please stop by or check us out on Facebook. Thank you. Thanks for the awesome read! I love Mid-Mod Mall and The Brass Armadillo. Glad they were in the list! I am the owner of a new used furniture store with locations in Denver and Northglenn called The Good Couch. We specialize in used couches and living room furniture. Our mission is to give back to the community through partnering with local non-profits who specialize in homeless outreach. We provide free in-home pickup of large furniture items in the Denver area have prevented over 400,000 lbs of couches from going to the landfill. Our couches are cleaned and refurbished and look amazing when they are finished. All purchases include free delivery and move-in and our reviews are outstanding! In September of last year we raised almost $2,000 for Colorado Coalition for the Homeless and were featured on CBS Channel 4 News when we climbed a couch to the top of Mt. Elbert and back for a fundraiser. We have donated almost $10,000 dollars to Colorado Coalition for the Homeless since 2018. I am writing this to ask if we could be added to this blog post or to see if you would be interested in writing an article about us. We have another outrageous fundraiser coming up this year that might be fun to cover. I look forward to hearing back from you! Please excuse the long-winded email. Thanks for the comment! We cannot edit this after it is live unless we do an updated guide, for which we will keep you in mind.